Silverblade Paladin is over $7 using TCG mid prices. The W/G Humans deck took 4th at SCG St. Louis, and most of the deck has been creeping upward in price since its 1st place finish a few weeks ago. Look for cheap Mayor of Avabruck, Champion of the Parish as well as Paladins and Sublime Archangel during the next week. Archangel was the most asked about card this weekend at a 200 person PTQ that I attended and there were almost none in the room. The card is poised for a price bump with another good result or two. Second Sunrise is falling on TCG Player. I don’t believe this is any kind of indictment on the card or the deck. Rather, no one was willing to pay $12 for Second Sunrise. If Eggs doesn’t do well in GP Chicago this weekend, look for staples to drop more and become a buy low for the upcoming PTQ season. 1. Did you see Josh Hendricks’s 11th-place deck in the SCG St. Louis Open? Go look and take a minute to digest it. 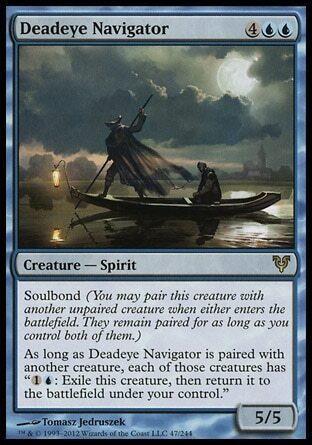 Deadeye Navigator is a Commander staple, and will climb in the long term with or without competitive results. The deck should be an FNM all-star regardless of further high profile finishes. Navigator has a chance to jump if it continues to put up results by combining casual and competitive demand. 2. 6 of the top 8 decks of SCG St. Louis, and 7 of the top 8 of the TCG Player 5k in Brooklyn ran counterspells, forcing the bigger, slower decks out of the top tables. The return of counterspells makes me think it’s time to dust off Cavern of Souls–this card has been invisible outside of the U/W all creature decks for the past couple months and is a great buy-low as the meta continues to adapt. 3. Sorin, Lord of Innistrad is out of stock at $20 on SCG (only $17 on Legit). The B/W/G Junk deck that took first place at SCG Providence has had mixed results, but helped launch Sorin on this current price spike. I don’t like Sorin in the long term because of the Sorin vs. Tibalt deck, but in the next month or two there is certainly room to grow if it finds a home in another deck. 4. People are starting to play Bonfire of the Damned again. There’s obviously room for the card to grow (it’s only $28 on Legit). I’m personally a little hesitant to buy in, but I couldn’t blame anyone who felt otherwise. 5. In the battle of mid-range green decks, Garruk, Primal Hunter seems to be king, though you wouldn’t know it from the price ($7 using TCG mid prices, Out of Stock at $8 on SCG). I like this card in the couple months before Gatecrash, assuming the format stays grindy. It could hit $12+ retail. 6. Thundermaw Hellkite is still climbing thanks to the U/W/R “Midrange” deck popularized by Todd Anderson. I’m not sure how much room there is for the Dragon to grow, because it’s no longer seeing much play in other decks besides Mono Red. I think its time to start getting rid of extra copies you’ve accumulated. 7. 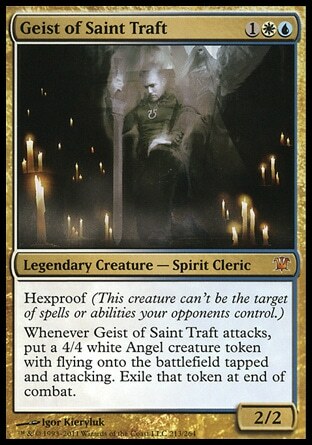 Geist of Saint Traft is out of stock at $30 on SCG. We’re going to see another price bump on the card soon enough, but I find myself wondering how much further it can really go. I’m not saying to sell off extra copies just yet; more that I’d be paying attention and be ready to move them once the price jumps again. 8. Burning Wish is $22 using TCG mid prices, and has doubled in price since the beginning of September, presumably because of its unrestricting in Vintage. This is a great pick up from shops that haven’t updated their pricing because the card isn’t asked about much (I picked up 2 for $8 each this weekend from a store in Sacramento). 9. Arid Mesa, Marsh Flats, and Verdant Catacomb are creeping upwards (up to $14 using TCG mid prices). These fetches aren’t flashy like the price bump of their Blue counterparts, but there is also still money to be made on the non-blue Zendikar fetches. I think they are still the best investments in the Modern format. 10. Commander’s Arsenal is absurdly expensive, but I believe there are a few comparatively cheap cards that are great long term plays. The foil copies of Kaalia of the Vast, Maelstrom Wanderer, and The Mimeoplasm are the ‘pimpest’ version of the cards available, and will have a consistent demand from Commander players looking to foil out their favorite decks. Your brains appear to be safe… for now. Zombies has basically disappeared from the top tables the past few weeks, thanks to the prevalence of Thragtusk and Angel of Serenity. The prices of Geralf’s Messenger and Gravecrawler haven’t really dipped yet which means you still have time get out if you haven’t already. Luckily, a new aggro deck is ready to take the reins, Mono Red. It has a few good paper finishes over the past few weeks, but it is everywhere on Magic Online. Take a look at this. Hellrider is up to $4 using TCG mid prices, and should continue to rise. Similarly, I’m very bullish on Ash Zealot and Stromkirk Noble even though they haven’t moved much yet. Part of the appeal of the Mono Red is the price, which makes it even more appealing given the cost of many of the Tier 1 decks. There is always a market for the staples of cheap, competitive aggro decks. It’s in your best interest to pick them up when you have the opportunity.